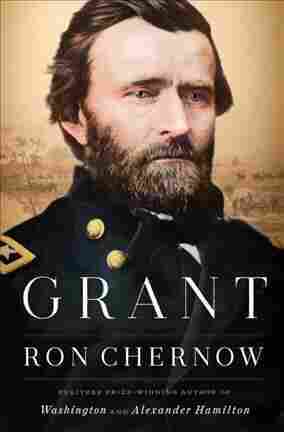 From Hamilton To Grant: Ron Chernow Paints A 'Farsighted' President in New Biography After the massive success of his last book, which inspired an award-winning Broadway musical, Pulitzer Prize-winning historian Ron Chernow is back with a new biography of President Ulysses S. Grant. It was an improbable story, and yet, it's true. Ron Chernow's 2005 biography of a Caribbean orphan who became a Revolutionary War hero, and then one of the nation's most consequential founding figures, became not just a bestseller but the catalyst for one of the most successful Broadway hits of all time — Hamilton. Now, Chernow has a new book, just out this week, which also aims to revise our understanding of a figure he sees as overlooked and misunderstood: The 18th president of the United States, Ulysses S. Grant. In it, Chernow aims to rehabilitate the way Americans think about the man who not only led the Union Army into victory during the Civil War but also led the country during the tumultuous era that followed. Chernow says that after writing about Alexander Hamilton and George Washington, he decided to give the Founding Fathers a rest. "And I had always had a fantasy about doing a big, sweeping saga about the Civil War and Reconstruction. And Ulysses S. Grant is really the central figure that unites those two periods, and it fascinates me that there are so many Americans who know about the Civil War battles in intimate detail, but they know nothing about Reconstruction," he says. In many ways, the North won the Civil War militarily and then lost the peace. You know, a group of writers, included many Confederate generals, began a school of thought called the Lost Cause in which they began to romanticize the Confederacy. They said that the slaves had all been happy. They said that the war was not caused by slavery, the war was caused by states' rights. They said that Robert E. Lee was the great general. And not only the greater general, but he was a perfect Christian gentleman, and he embodied all of these noble values. And the more that Robert E. Lee was elevated by many, particularly Southern historians, you know, part of that was really tearing down and denigrating Ulysses S. Grant. I think that was one of the most becoming traits of Ulysses S. Grant, in fact. You know, everyone knows him for the famous memoirs that he wrote in the last year of his life. And Grant only wrote those memoirs under duress. The only reason that he decided to write the memoirs was a year before he dies, two things happened almost simultaneously: Number one, he becomes the victim of the Bernie Madoff of his day, a young man named Ferdinand Ward, who was running a Ponzi scheme. Grant thought he was a multimillionaire. He woke up one morning and found out that he was worth exactly $80 and had been wiped out. Around the same time, he's diagnosed with cancer of the throat and tongue, so he's petrified that he's going to die and leave his wife destitute. So he writes the memoirs, again in agonizing pain, his mind often fogged by painkillers. And his publisher is Mark Twain. It becomes the great bestseller. And Twain said that his own role — contrary to myths that he wrote it — Twain said that his own role was restricted to relatively trivial matters of punctuation and grammar. And I actually went down to the Library of Congress and went through every page of the manuscript just to verify that it was in Grant's handwriting. And it was, except for some passages at the very, very end when he was close to death, and you could see he was dictating to his son or a stenographer. Well, it's a fascinating story because Grant grows up in an abolitionist family in southwest Ohio. He marries into a slave-owning family in Missouri. So he finds himself in the middle of his own private civil war between the Grants and the Dents. So what happens, you know, during the war with the Emancipation Proclamation, the Union Army can begin to recruit and train black soldiers. And Grant, who was a very honest man, sees at a place called Milliken's Bend in 1863 that, in fact, the black soldiers are extraordinarily courageous and disciplined. And, of course, their motivation could not have been higher. So Grant becomes the major force in terms of recruiting black soldiers. The caricature of his presidency was that it was, you know, stained by corruption, and nepotism and cronyism. But to my mind, the big story of his presidency is he's really farsighted in courageous action in terms of protecting ... former slaves who are now full-fledged American citizens. People don't realize — you know, we had an attorney general going back to George Washington, but there was no Justice Department until Grant's first term in office. And the very week that the Justice Department was created, Grant appointed a crusading man from Georgia named Amos Akerman. And Grant was the major force behind something called the Ku Klux Klan Act. Amos Akerman brings 3,000 indictments, gets more than a thousand convictions and crushes the Klan at a time when no Southern sheriff would arrest a member of the Klan. No Southern jury would acquit a member of the Klan. No Southern white would testify against the Klan. The caricature of his presidency was that it was, you know, stained by corruption, and nepotism and cronyism. But to my mind, the big story of his presidency is he's really farsighted in courageous action in terms of protecting those four million former slaves who are now full-fledged American citizens, but who were under constant threat from the Klan in the South. And, you know, when — in 1948, Arthur Schlesinger Jr. did a poll of presidential historians, asking them to rank them in order. And Grant was down next to the bottom. In fact, I think Warren Harding was last, and Grant was next to last. Well, in the most recent ranking, Grant was 22, which meant that he was right in the middle. And I think that in the stock market of historical reputations, Grant's stock is definitely rising. This story was produced for radio by Jennifer Liberto and Matthew S. Schwartz, and adapted for the web by Petra Mayer.